As a wise man once said, "Vote early and often." 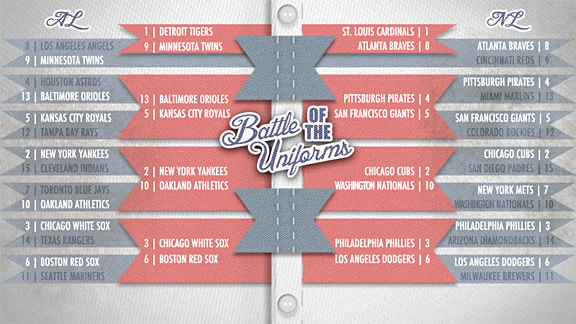 And that's exactly what baseball fans did Monday, as the first-round balloting in the Battle of the Uniforms attracted an enthusiastic electorate and gave us some interesting results. 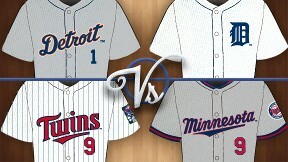 The Yankees' uniforms trouncing the Indians' look? No surprise there. 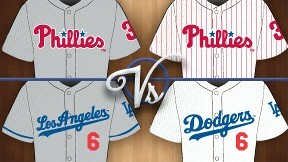 Ditto for the Phillies over the Diamondbacks and the Giants over the Rockies, among others. Still, there were some mild upsets, such as the Twins beating the Angels and, in the biggest eyebrow raiser of the first round, the Nationals beating the Mets. • Orioles over Astros, 79 percent to 21 percent. • Red Sox over Mariners, 73 percent to 27 percent. 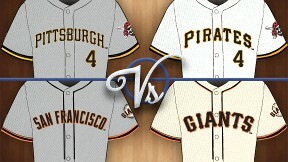 • Pirates over Marlins, 81 percent to 19 percent. And so on. The biggest landslide? The Cubbies trounced the Padres by a whopping 86 percent to 14 percent, offering convincing proof that San Diego needs to go back to the drawing board and get some new uniforms (and giving beleaguered Cubs fans a little morsel of success to feel good about). As for the second round, there are some intriguing matchups. 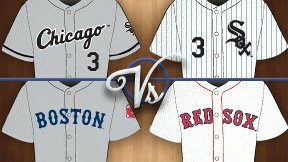 In the American League, Boston faces off against Chicago -- a battle of the Sox! And in the National League, the Pirates and Giants will be reminding people that they were wearing black long before it became a trendy color. 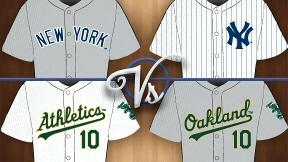 The most interesting pairing in this round, though, finds the Yankees, the ultimate example of old-fashioned aesthetic tradition, facing the A's, whose green-and-gold look ushered in baseball's Technicolor era. It's old-school versus new-school. Too bad George Steinbrenner and Charlie Finley aren't around to witness it -- they'd likely be voting along with the rest of us. Note: Second-round polls close at 9 a.m. ET Wednesday, and the next round begins shortly thereafter. Can one D beat a T and a C (plus an occasional M)? It can if it's old English. 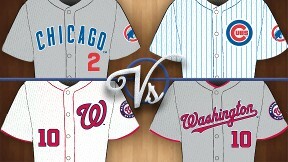 It cost roughly $200 million to dress the Yankees in their pinstripes. The Athletics went to a thrift shop but still look @#&% awesome. Sigh. If only these two teams wore their pant legs high enough that we would actually see the socks that are the entire basis for their names. 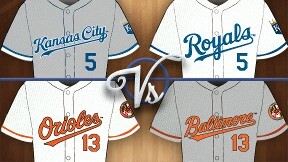 Great battle between Royals blue and the Orioles' vibrant orange. And you know Buck Showalter will make sure their caps are on straight. 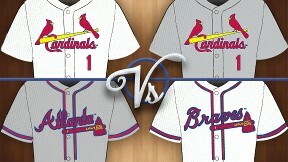 Which jersey prop is stronger: the tomahawk or the bat? An established veteran against an up-and-comer. The smart money's on the veteran. Two classic looks here. A pity that one of them will have to lose. Interesting pairing here: black and orange versus black and gold.